The society Totem 7 (Laysan Albatross) represents is an unhealthy one, in which consumer marketplace greed has taken priority over reverence for nature. 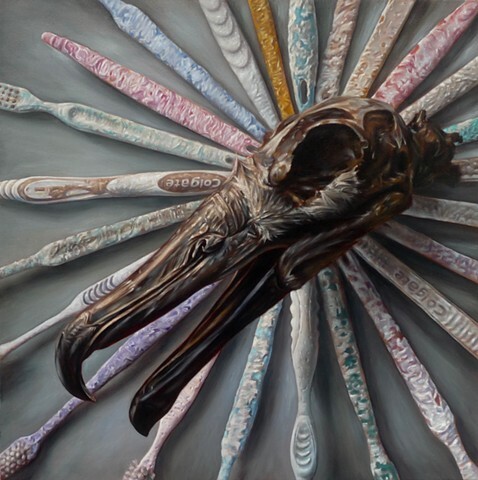 To create it, I photographed a laysan albatross skull at the Bishop Museum placed upon a radiating arrangement of toothbrushes, weathered and warped by their time at sea. The wasteful indulgences of our culture have a horrifying impact upon the albatross. The birds swallow floating plastic waste, mistaking it for fish, while rising sea levels increased by global warming threaten their nesting colonies.